The incarnation tells us central truths concerning God and us. If God became human without ceasing to be God and without compromising the integrity of the creature the he became, God must not be a competitor with his creation. In many ancient myths and legends, divine figures such as Zeus or Dionysus enter into human affairs only through aggression, destroying or wounding that which they invade… But there is none of this in the Christian doctrine of the incarnation. The Word does indeed become human, but nothing of the human is destroyed in the process; God does indeed enter into his creation, but the world is thereby enhanced and elevated. The God of the incarnation is not a competitive supreme being but rather, in the words of Thomas Aquinas, the sheer act of being itself, that which grounds and sustains all of creation, the way a singer sustains a song. This is the start of a few posts where I “show my cards”, as it were, to some doctrinal developments in my own theology, which has happened over a period of 2-3 years. In this post I’m going to critique the theology of limited atonement and offer an argument for universal atonement or better put, objective atonement. I’ve become convinced within the last couple years that limited atonement is not a biblical doctrine; rather, it is a logical conclusion based off of Augustine’s and Calvin’s doctrine of unconditional election. This post is not a critique of election, but it is a critique of taking logic too far. Limited atonement historically, it is almost certain, was not a doctrine that Calvin held (or even had the categories for), but is rather a Reformed scholastic development of the logic Calvin’s doctrine of election. The logic is that if God has determined to save only the elect, then Christ must’ve died only for the elect. Thus, the atonement is limited, not in its power of course, but certainly in its scope and embrace. Whatever you think of election, what I want to propose here is that the doctrine of limited atonement might be logical, but it is not biblical. The reason I say this is because limited atonement bases its doctrine after the scope of election, when in fact atonement doctrine should be based off of the reality of the incarnation (election is a decretal reality. It should not affect the Christological doctrines, including atonement theology). Put another way, I am arguing that the incarnation is intimately connected to the atonement and demands that Christ’s cross-work be all-embracing, objective and for every human being. What do I mean? I want us to consider: what happened in the incarnation? It is not simply that God the Son become a man to be a representative or a legal head. That is true, but not true enough. When we think of the incarnation, we must consider the metaphysical, ontological realities involved. The incarnation was a dramatic, reality shifting event: God the Son took upon himself a human nature and entered into the common, shared reality of mankind. And in doing so, he altered the human condition forever. I’m convinced that this is something the Western Christian world, with its individual emphasis, fails to realize: within the biblical worldview, the human race is not a collection of individuals; rather, the human race is a collective unity. The nature that all humans share is an ontological oneness. We all share in the same nature, thus uniting us all in a unique way. This is why when Adam fell into sin and death, we all fell with him. We are a unity. We are all metaphysically joined, and Adam’s sin affects us negatively because of that unity. Thus many of the Eastern Fathers have tended to talk about original sin in medical terms instead of legal terms. If a leg is amputated, the foot and toes die too. This is because they are all connected. It is the same with humanity. This affects our view of the incarnation and consequently of the death and resurrection of Christ: Christ’s death and resurrection was not simply on our behalf; of course, it was. But it was also a radical participation in humanity’s shared fallenness. Through his union with the human condition in the incarnation, Christ participated in our common death and overcame it in his resurrection. Thus it was not simply that Christ died on the cross: the entire Adamic reality died with him in the cross. And it was not simply that Christ rose in the resurrection: the last Adam lifted humanity out of the grave through his victory over death, thus glorifying and divinizing humanity in himself. The cross and resurrection are massive, ontological, reality-shifting events when placed in this light. Gary Deddo goes on to describe humanity is terms of a tree (see the icon above). Adam was the first human off of whom we branch. His death was ours, not legally per se, but actually; his apostasy corrupted all of humanity, and thus all are born into death. Jesus is the second Adam who, by uniting himself to the whole of the human tree, entered into our condition and through his death and resurrection, shifted the ontological state of humanity in an important way. Thus, and this is the point, what happened to Christ in his life, death and resurrection, happened to all humanity. All-embracing. This also accounts for the striking universal statements about human salvation in certain Pauline texts. To be sure, Paul speaks of wrath and judgment, and of the need for conversion. But there are also striking, indeed alarming texts which speak of the cross-work of Christ as affecting all men without exception. For instance, Paul says in 2 Corinthians 5:18 that in Christ God was “reconciling the world to himself”. Or Romans 5:18: “therefore, as one trespass led to condemnation for all men, so one act of righteousness leads to justification and life for all men”. Or Colossians 1:18-19, “For in [Christ] all the fullness of God was pleased to dwell, and through him to reconcile to himself all things, whether on earth or in heaven, making peace by the blood of his cross”. What can we do with these texts? If we are truly and really honest, we must say that in Christ something fundamental has happened to mankind. Mankind has been saved from death and sin! How can this be so? 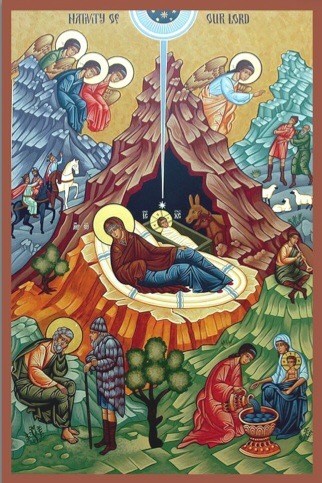 The incarnation: God’s union with our common humanity renders the atonement holistic and not limited: what has happened to Christ has thus happened to the whole of the human nature without exception. Thus in Christ, all mankind and the entire cosmos is in principle saved. This is why many of the early church fathers taught that the incarnation was in itself a saving event. Thus Jesus’ resurrection affects all people; it is an objective work that shifts the human existence as we know it. However, it must be subjectively received and applied. Mind you, the Lutheran church believes in unconditional election! But they don’t buy limited atonement. Thus this teaching of objective justification verses subjective justification. I’ve gone long enough. In the next couples posts I will look at justification from the perspective of Paul’s very first sermon, and then at differing models of atonement. Karl Barth has an interesting take on the incarnation. Many theologians see the incarnation as God’s “condescension”, or “humiliation” — indeed it is God condescending to mankind, becoming one of us. But all too often, the incarnation is presented as God doing what is against his nature: it is against his exalted Lordship to condescend, to become lowly, to serve, to bear our burdens. However, what Barth contends is that the incarnation is what makes God God. His becoming low, his servanthood, his coming near to us, his loving will to redeem and elevate mankind to himself: this is what proves and reveals his Lordship. It is what makes him God in contrast to all other false gods. As Barth says: the incarnation contrasts the true God with false gods “who cannot and will not be servants, who are therefore no lords, whose being is not a truly divine being”. (Church Dogmatics: An Introduction and Reader, Michael Allen, 143) In other words, all other gods command that we come up to them, to ascend to their level, not because they are truly gods, but in fact because they are false, unable to come to us. They are, as Barth says, “empty loveless gods which are incapable of condescension and self-humiliation” (145). They will not serve, indeed they cannot serve in their impotence. In contrast, the incarnation is proof of God’s divinity. It is proof of his unlimited love and power that he is able to limit and even condemn himself for our sakes. I think this is a great insight: God’s strength and greatness is displayed in his ability and willingness to limit himself, to bind himself to our weakness, and thereby lift us up. No other gods can do this! Frank Sheed has a very lively and helpful discourse in his Theology and Sanity on the incarnation. Is Christ God? Is he man? How can he possibly be both? Is this some sort of schizophrenia? God the Son was a Person, a Someone, possessing the nature of God in its fullness, and this in the eternity of the Divine Being. At a certain point in time He took to Himself and made His own a human nature. Thus we have the unique instance of one single person with two natures, divine and human. To the question “Who are you”? Christ would have but one answer. He is the Second Person of the Blessed Trinity, God the Son, the Word. But to the question “What are you”? Christ Our Lord would have two answers, for He has two natures; He is God and He is man. What Sheed explains is that the person and the natures must be understood when examining the mystery of the incarnation. It was the person of the Son who became incarnate. But that person possessed two complete natures: God and man. How this can be is simply a mystery. But this does help us understand who and what we are talking about when we think of the incarnation.